Optimizer defaults are adequate for most operations, but not all. In some cases you may have information unknown to the optimizer, or need to tune the optimizer for a specific type of statement or workload. In such cases, influencing the optimizer may provide better performance. 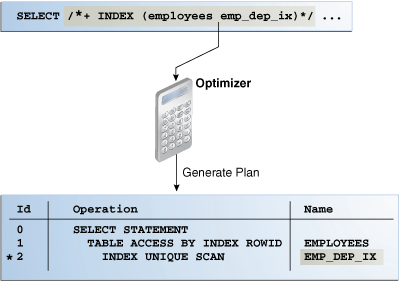 You can influence the optimizer using several techniques, including SQL profiles, SQL Plan Management, initialization parameters, and hints. This chapter explains which initialization parameters affect optimization, and how to set them. Optimizer hints are special comments in a SQL statement that pass instructions to the optimizer. The following figure shows the principal techniques for influencing the optimizer. Description of "Figure 19-1 Techniques for Influencing the Optimizer"
The overlapping squares in the preceding diagram show that SQL plan management uses both initialization parameters and hints. SQL profiles also technically include hints. A stored outline is a legacy technique that serve a similar purpose to SQL plan baselines. Parameters influence many types of optimizer behavior at the database instance and session level. "Influencing the Optimizer with Initialization Parameters"
A hint is a commented instruction in a SQL statement. Hints control a wide range of behavior. "Influencing the Optimizer with Hints"
This package updates and manages optimizer statistics. The more accurate the statistics, the better the optimizer estimates. This chapter does not cover DBMS_STATS. A SQL profile is a database object that contains auxiliary statistics specific to a SQL statement. Conceptually, a SQL profile is to a SQL statement what a set of object-level statistics is to a table or index. A SQL profile can correct suboptimal optimizer estimates discovered during SQL tuning. SQL plan management is a preventative mechanism that enables the optimizer to automatically manage execution plans, ensuring that the database uses only known or verified plans. This chapter does not cover SQL plan management. In some cases, multiple techniques optimize the same behavior. For example, you can set optimizer goals using both initialization parameters and hints. 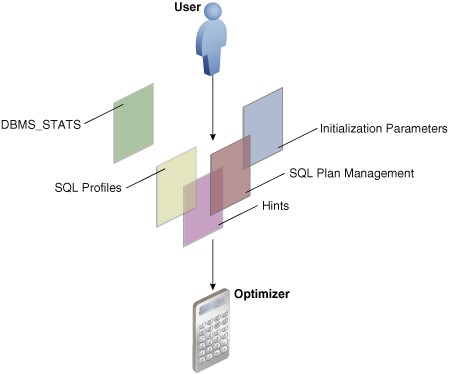 Oracle Database provides initialization parameters to influence various aspects of optimizer behavior, including cursor sharing, adaptive optimization, and the optimizer mode. The OPTIMIZER_FEATURES_ENABLE initialization parameter (or hint) controls a set of optimizer-related features, depending on the database release. The optimizer goal is the prioritization of resource usage by the optimizer. In Oracle Database, adaptive query optimization is the process by which the optimizer adapts an execution plan based on statistics collected at run time. The following table lists some of the most important optimizer parameters. Uses approximate query processing for all aggregation and analytic queries. Approximate processing is useful when you want to obtain faster query results and avoid writes to a temporary tablespaces. This optimizer uses a nondeterministic algorithm to make its estimations, which means that different queries can obtain different results. You can set this parameter to TRUE at the system or session level. This parameter changes the optimizer environment. It does not force the optimizer to change the SQL text for an affected query, but it does force the optimizer to reparse the query and create a new child cursor. Replaces queries that contain COUNT (DISTINCT expr) queries with APPROX_COUNT_DISTINCT. Approximate counts are useful when a column has a higher number of distinct values, and you want to obtain faster query results and avoid writes to a temporary tablespaces. Only use approximation when your application can tolerate a nonzero error rate. Converts exact percentile functions to their approximate percentile function counterparts. Approximate percentile function queries are faster than their exact percentile function query counterparts, so they can be useful in situations where a tolerable amount of error is acceptable in order to obtain faster query results. Set to PERCENTILE_CONT to convert PERCENTILE_CONT functions to APPROX_PERCENTILE, and PERCENTILE_DISC to convert PERCENTILE_DISC functions to APPROX_PERCENTILE (or ALL to convert both). CURSOR_INVALIDATION Provides the default cursor invalidation level for DDL statements. IMMEDIATE sets the same cursor invalidation behavior for DDL as in releases before Oracle Database 12c Release 2 (12.2). This is the default. DEFERRED allows an application to take advantage of the reduced cursor invalidation for DDL without making any application changes. Deferred invalidation reduces the number of cursor invalidations and spreads the recompilation workload over time. For this reason, a cursor may run with a suboptimal plan until it is recompiled, and may incur small execution-time overhead. You can set this parameter at the SYSTEM or SESSION level. See "About the Life Cycle of Shared Cursors". Converts literal values in SQL statements to bind variables. Converting the values improves cursor sharing and can affect the execution plans of SQL statements. The optimizer generates the execution plan based on the presence of the bind variables and not the actual literal values. Set to FORCE to enable the creation of a new cursor when sharing an existing cursor, or when the cursor plan is not optimal. Set to EXACT to allow only statements with identical text to share the same cursor. Specifies the number of blocks that are read in a single I/O during a full table scan or index fast full scan. The optimizer uses the value of this parameter to calculate the cost of full table scans and index fast full scans. Larger values result in a lower cost for full table scans, which may result in the optimizer choosing a full table scan over an index scan. The default value of this parameter corresponds to the maximum I/O size that the database can perform efficiently. This value is platform-dependent and is 1 MB for most platforms. Because the parameter is expressed in blocks, it is set to a value equal to the maximum I/O size that can be performed efficiently divided by the standard block size. If the number of sessions is extremely large, then the multiblock read count value decreases to avoid the buffer cache getting flooded with too many table scan buffers. Controls adaptive plans. An adaptive plan has alternative choices. The optimizer decides on a plan at run time based on statistics collected as the query executes. See "About Adaptive Query Plans". Controls the reporting mode for automatic reoptimization and adaptive plans (see "Adaptive Query Plans"). By default, reporting mode is off (false), which means that adaptive optimizations are enabled. If set to true, then adaptive optimizations run in reporting-only mode. In this case, the database gathers information required for an adaptive optimization, but takes no action to change the plan. For example, an adaptive plan always choose the default plan, but the database collects information about which plan the database would use if the parameter were set to false. You can view the report by using DBMS_XPLAN.DISPLAY_CURSOR. Controls adaptive statistics. The optimizer can use adaptive statistics when query predicates are too complex to rely on base table statistics alone. Sets the optimizer mode at database instance startup. Possible values are ALL_ROWS, FIRST_ROWS_n, and FIRST_ROWS. Controls the cost analysis of an index probe with a nested loop. The range of values 0 to 100 indicates percentage of index blocks in the buffer cache, which modifies optimizer assumptions about index caching for nested loops and IN-list iterators. A value of 100 infers that 100% of the index blocks are likely to be found in the buffer cache, so the optimizer adjusts the cost of an index probe or nested loop accordingly. Use caution when setting this parameter because execution plans can change in favor of index caching. Adjusts the cost of index probes. The range of values is 1 to 10000. The default value is 100, which means that the optimizer evaluates indexes as an access path based on the normal cost model. A value of 10 means that the cost of an index access path is one-tenth the normal cost of an index access path. This parameter enables (TRUE) or disables (FALSE) all Oracle Database In-Memory (Database In-Memory) optimizer features, including the cost model for the IM column store, table expansion, Bloom filters, and so on. Setting the parameter to FALSE causes the optimizer to ignore the INMEMORY property of tables during the optimization of SQL statements. Enables or disables the use of invisible indexes. Controls whether the database uses the SQL query result cache for all queries, or only for the queries that are annotated with the result cache hint. When set to MANUAL (the default), you must use the RESULT_CACHE hint to specify that a specific result is to be stored in the cache. When set to FORCE, the database stores all results in the cache. When setting this parameter, consider how the result cache handles PL/SQL functions. The database invalidates query results in the result cache using the same mechanism that tracks data dependencies for PL/SQL functions, but otherwise permits caching of queries that contain PL/SQL functions. Because PL/SQL function result cache invalidation does not track all kinds of dependencies (such as on sequences, SYSDATE, SYS_CONTEXT, and package variables), indiscriminate use of the query result cache on queries calling such functions can result in changes to results, that is, incorrect results. Thus, consider correctness and performance when choosing to enable the result cache, especially when setting RESULT_CACHE_MODE to FORCE. Changes the memory allocated to the result cache. If you set this parameter to 0, then the result cache is disabled. The value of this parameter is rounded to the largest multiple of 32 KB that is not greater than the specified value. If the rounded value is 0, then the feature is disabled. Specifies the maximum amount of cache memory that any single result can use. The default value is 5%, but you can specify any percentage value between 1 and 100. Specifies the number of minutes for which a result that depends on remote database objects remains valid. The default is 0, which implies that the database should not cache results using remote objects. Setting this parameter to a nonzero value can produce stale answers, such as if a remote database modifies a table that is referenced in a result. Enables the optimizer to cost a star transformation for star queries (if true). The star transformation combines the bitmap indexes on the various fact table columns. The parameter accepts one of a list of valid string values corresponding to the release numbers, such as 11.2.0.2 or 12.2.0.1. You can use this parameter to preserve the old behavior of the optimizer after a database upgrade. For example, if you upgrade Oracle Database 12c Release 1 (12.1.0.2) to Oracle Database 12c Release 2 (12.2.0.1), then the default value of the OPTIMIZER_FEATURES_ENABLE parameter changes from 12.1.0.2 to 12.2.0.1. For backward compatibility, you may not want the execution plans to change because of new optimizer features in a new release. In such cases, you can set OPTIMIZER_FEATURES_ENABLE to an earlier version. If you upgrade to a new release, and if you want to enable the features in the new release, then you do not need to explicitly set the OPTIMIZER_FEATURES_ENABLE initialization parameter. Oracle does not recommend explicitly setting the OPTIMIZER_FEATURES_ENABLE initialization parameter to an earlier release. To avoid SQL performance regression that may result from execution plan changes, consider using SQL plan management instead. You recently upgraded the database from Oracle Database 12c Release 1 (12 1.0.2) to Oracle Database 12c Release 2 (12.2.0.1). You want to preserve the optimizer behavior from the earlier release. Log in to the database with the appropriate privileges, and then query the current optimizer features settings. Set the optimizer features setting at the instance or session level. The preceding statement restores the optimizer functionality that existed in Oracle Database 12c Release 1 (12.1.0.2). When you set the OPTIMIZER_MODE value to ALL_ROWS, the database uses the least amount of resources necessary to process all rows that the statement accessed. For batch applications such as Oracle Reports, optimize for best throughput. Usually, throughput is more important in batch applications because the user is only concerned with the time necessary for the application to complete. Response time is less important because the user does not examine the results of individual statements while the application is running. When you set the OPTIMIZER_MODE value to FIRST_ROWS_n, the database optimizes with a goal of best response time to return the first n rows, where n equals 1, 10, 100, or 1000. For interactive applications in Oracle Forms or SQL*Plus, optimize for response time. Usually, response time is important because the interactive user is waiting to see the first row or rows that the statement accessed. The primary application is interactive, so you want to set the optimizer goal for the database instance to minimize response time. For the current session only, you want to run a report and optimize for throughput. Connect SQL*Plus to the database with the appropriate privileges, and then query the current optimizer mode. At the instance level, optimize for response time. At the session level only, optimize for throughput before running a report. If OPTIMIZER_ADAPTIVE_REPORTING_ONLY is set to true, then adaptive optimization runs in reporting-only mode. In this case, the database gathers information required for adaptive optimization, but does not change the plans. An adaptive plan always chooses the default plan, but the database collects information about the execution as if the parameter were set to false. The OPTIMIZER_FEATURES_ENABLE initialization parameter is set to 12.1.0.1 or later. The OPTIMIZER_ADAPTIVE_REPORTING_ONLY initialization parameter is set to false (default). You want to disable adaptive plans for testing purposes so that the database generates only reports. Connect SQL*Plus to the database as SYSTEM, and then query the current settings. At the session level, set the OPTIMIZER_ADAPTIVE_REPORTING_ONLY initialization parameter to true. Run DBMS_XPLAN.DISPLAY_CURSOR with the +REPORT parameter. When the +REPORT parameter is set, the report shows the plan the optimizer would have picked if automatic reoptimization had been enabled. The optimizer uses hints to choose an execution plan for the statement unless prevented by some condition. Use hints to influence the optimizer mode, query transformation, access path, join order, and join methods. In some cases, you can specify join order hints in a SQL statement so that it does not access rows that have no effect on the result. For example, The following figure shows how you can use a hint to tell the optimizer to use a specific index for a specific statement. Description of "Figure 19-2 Optimizer Hint"
The advantage of hints is that they enable you to make decisions normally made by the optimizer. In a test environment, hints are useful for testing the performance of a specific access path. For example, you may know that an index is more selective for certain queries, as in Figure 19-2. In this case, the hint may cause the optimizer to generate a better plan. The disadvantage of hints is the extra code that you must manage, check, and control. Hints were introduced in Oracle7, when users had little recourse if the optimizer generated suboptimal plans. Because changes in the database and host environment can make hints obsolete or have negative consequences, a good practice is to test using hints, but use other techniques to manage execution plans. Oracle provides several tools, including SQL Tuning Advisor, SQL plan management, and SQL Performance Analyzer, to address performance problems not solved by the optimizer. Oracle strongly recommends that you use these tools instead of hints because they provide fresh solutions as the data and database environment change. You can use hints for tables, query blocks, and statements. When you specify a hint in a statement block, the hint applies to the appropriate query block, table, or entire statement in the statement block. The hint overrides any instance-level or session-level parameters. You must enclose hints within a SQL comment. Oracle Database SQL Language Reference for the most common hints by functional category. USE_NL(table1 table2) is not considered a multitable hint because it is a shortcut for USE_NL(table1) and USE_NL(table2). The preceding statement has two blocks, one for each component query. Hints in the first component query apply only to its optimization, not to the optimization of the second component query. For example, in the first week of 2015 you query current year and last year sales. You apply FIRST_ROWS(10) to the query of last year's (2014) sales and the ALL_ROWS hint to the query of this year's (2015) sales. The database ignores incorrectly specified hints. The database also ignores combinations of conflicting hints, even if these hints are correctly specified. If one hint is incorrectly specified, but a hint in the same comment is correctly specified, then the database considers the correct hint. The database does not issue error messages for hints that it ignores. A statement block can have only one comment containing hints, but it can contain many space-separated hints. For example, a complex query may include multiple table joins. If you specify only the INDEX hint for a specified table, then the optimizer must determine the remaining access paths and corresponding join methods. The optimizer may not use the INDEX hint because the join methods and access paths prevent it. Example 19-2 uses multiple hints to specify the exact join order. The driving table in a join is the table to which other tables are joined. In general, the driving table contains the filter condition that eliminates the highest percentage of rows in the table. The join order can have a significant effect on the performance of a SQL statement. Avoid a full table scan when an index retrieves the requested rows more efficiently. Avoid using an index that fetches many rows from the driving table when you can use a different index that fetches a small number of rows. Choose the join order so that you join fewer rows to tables later in the join order. Choose the driving table and the driving index (if any). Each of the first three conditions in the previous example is a filter condition that applies to a single table. The last two conditions are join conditions. Filter conditions dominate the choice of driving table and index. In general, the driving table contains the filter condition that eliminates the highest percentage of rows. Because the range of 100 to 200 is narrow compared with the range of acol, but the ranges of 10000 and 20000 are relatively large, taba is the driving table, all else being equal. With nested loops joins, the joins occur through the join indexes, which are the indexes on the primary or foreign keys used to connect that table to an earlier table in the join tree. Rarely do you use the indexes on the non-join conditions, except for the driving table. Thus, after taba is chosen as the driving table, use the indexes on b.key1 and c.key2 to drive into tabb and tabc, respectively. Choose the best join order, driving to the best unused filters earliest. You can reduce the work of the following join by first joining to the table with the best still-unused filter. Therefore, if bcol BETWEEN is more restrictive (rejects a higher percentage of the rows) than ccol BETWEEN, then the last join becomes easier (with fewer rows) if tabb is joined before tabc. You can use the ORDERED or STAR hint to force the join order.